So it’s back to life as usual. I also finally figured out my Halloween costume. 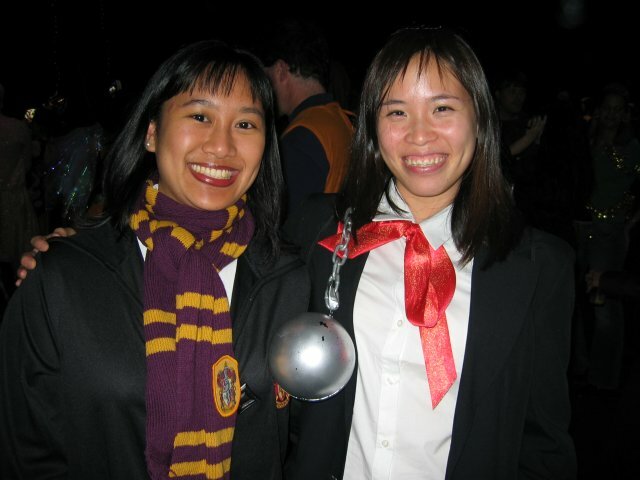 I ended up going as Hermione (Harry Potter), like I originally wanted. I found a Gryffindor robe and scarf from the boys section of the Halloween store which I wore with a gray plaid skirt, white turtleneck, black knee highs, and black mary janes. I didn’t wear a wig or make my hair all bushy the way Hermione’s is supposed to be so I guess technically, I was just Kelly the Gryffindor. Heh. 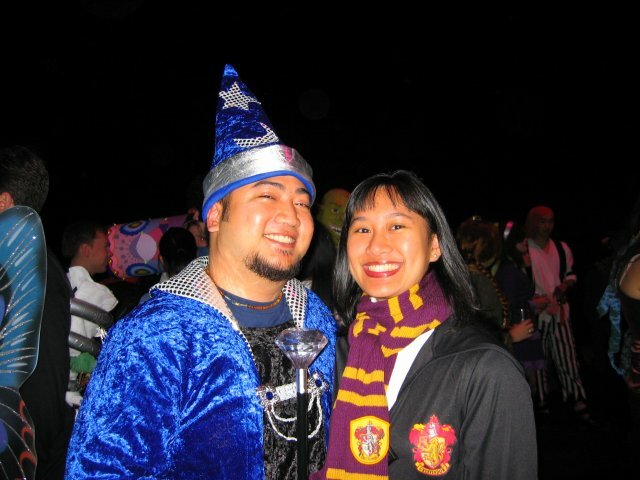 My friend Shirley works at Industrial Light and Magic so she got Rob and I tickets to go to their Halloween party. It was fun to see all the creative and elaborate costumes — it was clear that people put real thought into their costumes. (Unlike me and my store-bought costume — hee!) We saw people dressed up as… a gumball machine, Mr. and Mrs. Potato Head, a house, the Governator, Michael Jackson, Shrek, Legos… pretty much anything and everything you can think of. Seriously. I think my 2 favorites were 1) the giant T-Rex from Jurassic Park (this was amazing — it won the costume contest) and 2) Jango Fett-ish (BWAH!!! This was hilarious — basically a Chippendale’s outfit with the Jango helmet). Oh! 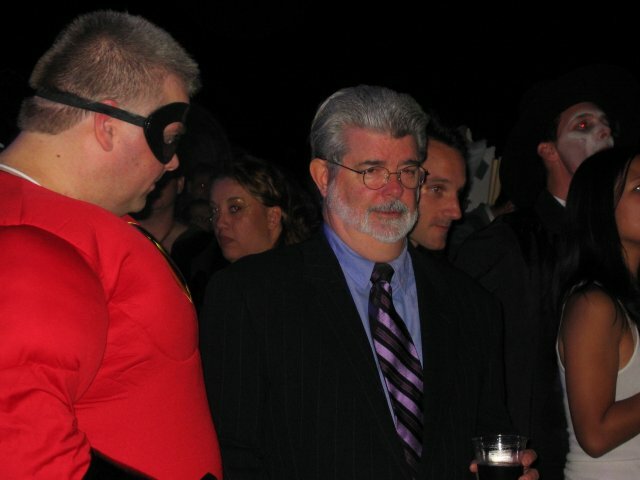 and we even saw George Lucas, which was really cool. Click the pictures to see the bigger versions. 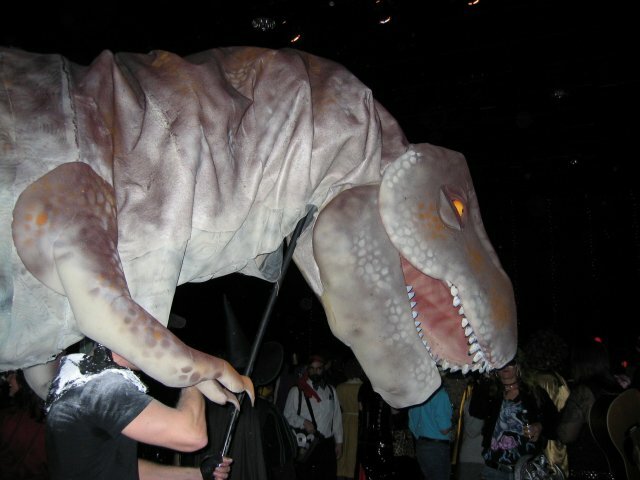 This is part of the T-Rex that won the costume prize. Amazon.com tells me that my OC DVDs are going to be delivered tomorrow. Squee! 😀 So excited. My cousin and her boyfriend are driving up here from southern California as I type. The two crazies decided to start a 6 hour drive at 9:30pm. Which means that they’ll get here at around 3:30am. And I’ll have to wake up to let them in! And then I’ll have to wake up again just a few hours later to make it to work by 7:30am for a meeting! I really should be in bed by now. Oh well. It’s not like I ever get enough sleep. Anyway, it’ll be fun to have my cousin over for a few days. I haven’t seen her in months so we’ll get the chance to catch up and I’ll finally get to see if I approve of her boyfriend. Hehe. 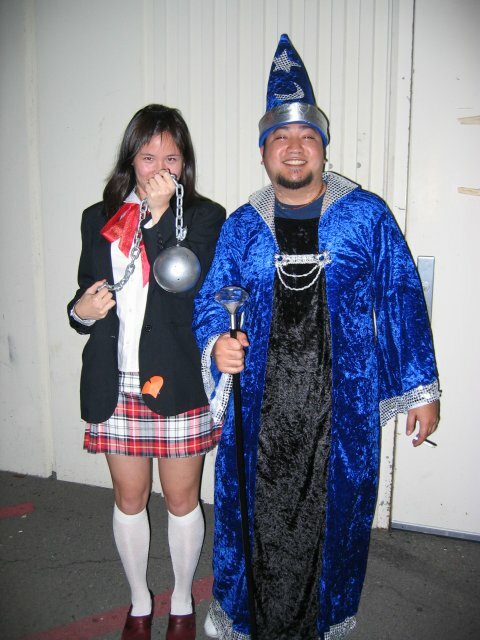 I also have to think about my Halloween costume for the party that Rob and I are attending on Saturday. I haven’t dressed up for Halloween in AGES. Probably not since my freshman year in high school. That was 1993. !!! Geesh. It’s been a loooong time. I was actually thinking about being Hermione (from Harry Potter) but I don’t know if I’ll be able to find the right robes and stuff. I’ve never been original when it comes to costumes anyway so I’ll probably just buy the first cute thing I see when I head to the Halloween store tomorrow night. First funeral: My grandfather in 1984. I was only 4. First piercing: A hole in each ear. My mom had them done when I was just a baby. First tattoo: None. And I don’t plan on getting one either. First credit card: Wells Fargo student credit card back in 1997 when I started college. First kiss: Huh. I should remember but I don’t. Must not have been very memorable. Heh. First enemy: I don’t remember this either. I don’t think I had any real enemies. ??? Or maybe I just don’t like to think I did. Last movie watched: Another one I can’t remember. Maybe Bourne Supremacy?